After almost 7 years of being with the fiance our families finally met this past weekend at his graduation. Of course I was nervous / scared / all those emotions you get, but knowing my family and how talkative and friendly they are I knew it would go off without a hitch. After the graduation we all headed out to dinner and after everyone came back to our apartment for some celebratory cake and coffee & tea champagne. 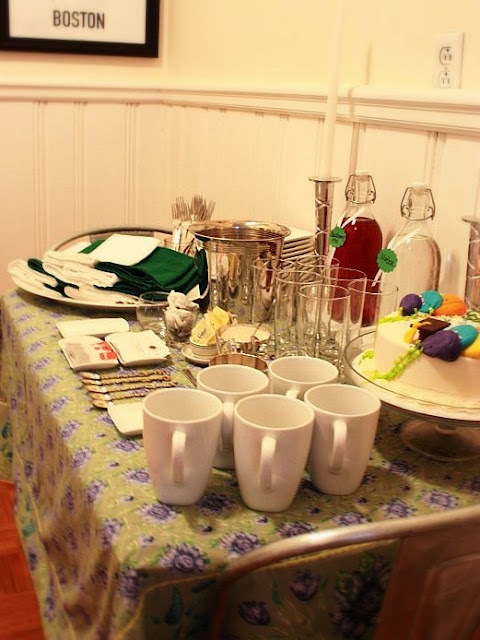 I tried my best to make Eddie Ross proud and set up the cake, coffee and tea table with some fun linens and sterling silver from my Grandma. These Ikea bottles are my favorite! 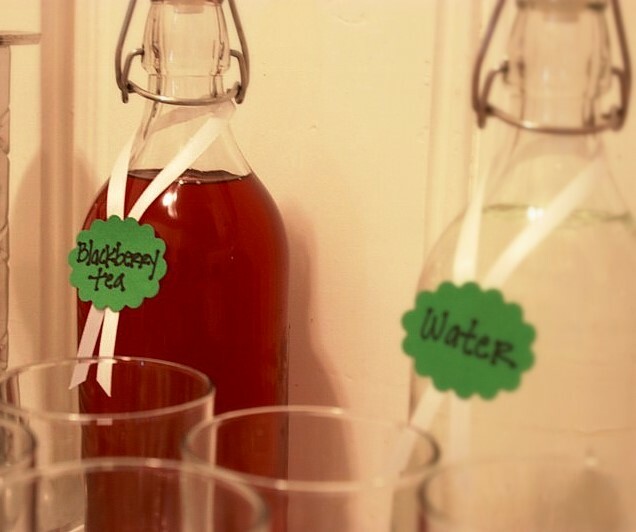 With a ribbon tag added, they make plain water and iced tea look pretty. This was all set up pretty last minute, so don't be too harsh. Both families had a great time and we're already planning the next get together...before the wedding of course. Congrats again to my fiance for graduating, I'm so proud of you! Hi honey! Congrats to your fiance on graduation, how exciting, what a fabulous accomplishment! I think your set up is lovely! 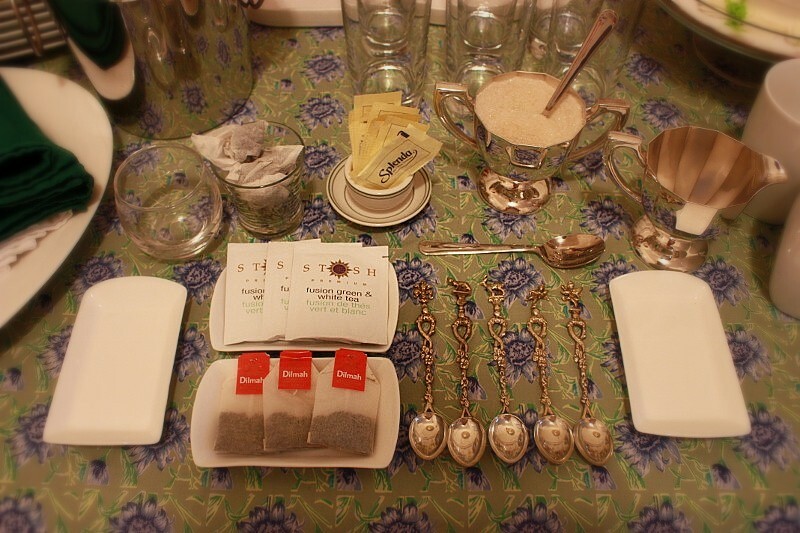 Those teaspoons are gorgeous and I love your Ikea juice bottles they are awesome, I had no idea Ikea carried them! I love the silver cream and suger servers too, so sweet. um is that tolix chair I spy? If so I'm super duper jealous. Oh and the Ikea bottles look great! Congrats to your fiance. It looks wonderful - Eddie would be proud!! I'm glad to hear that everything went so well. You are SO the hostess with the mostess! I love it! It looks great!!! 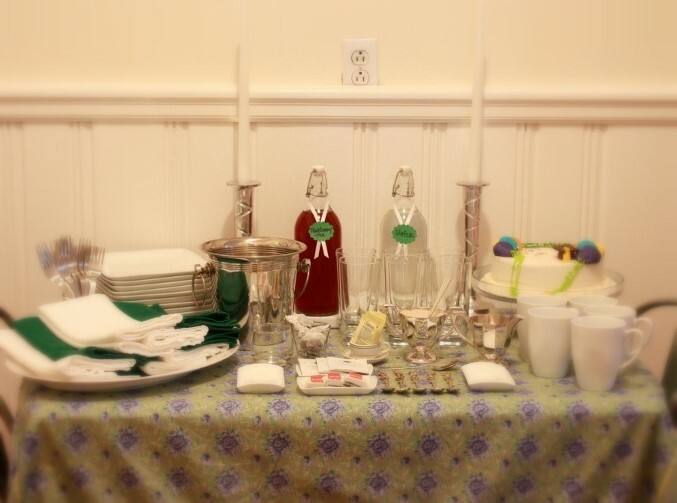 I tried to host a southern spring lunch for my inlaws a few weeks ago, ham and biscuits, iced tea etc, and it didn't look nearly as cute as this! It looks so inviting. Eddie Ross would be proud! he would definitely be proud, great work!! love the cake!! last minute is always best...not too much time to fret...it looks wonderful, especially those glass bottles. I need soma those! Congratulations to your fiance for graduating! Your table looks lovely and you're right, those Ikea bottles are the bomb! No apologies necessary - what a lovely table you set! I'm sure everyone loved it! I think it looks awesome. And, congrats to your fiance for being done with school! My only hope is that when the day comes that my sons snag a gal like you! The table looks fantastic! Congrats to your fiance!! Oh and WOW 7 years and the parents never met? Crazy! It looks wonderful!!! I think you did a fab job. Eddie would be proud. It looks great! Looks great! I am really enjoying your blog archives. We live in NH and we're trying to make our rented space "our own" as well and you've done some great things with your space! Looks great! You did a fabulous job and i LOVE those bottles! This turned out so cute! i think my favorite parts are the ikea bottles and those gorgeous spoons! I think Eddie will be proud! Your little set-up looks so cute! Love the bottles. Glad the meeting went well! My parents didn't meet the hub's parents until we started wedding-planning, too - and I remember that I was quite nervous as well! congrats to your sweetie & this is beautiful!! ih ad to laugh when you were like this was thrown together pretty last minute. it would have taken me a ton of thought/ effort to even try to come close to this. gorgeous & they're so lucky to have to as a futre daughter-in-law!! It's gorgeous! I love the little tags on the bottles. So cute. And I love grams silver! Looking at your party presentation... a woman after my own heart. People notice when that little extra effort is made. Congratulations to your fiance. PS glad I came across your blog. Gorgeous! Eddie Ross just texted me that he was hella proud.